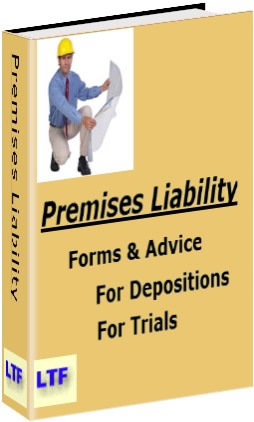 Premises Liability – Deposition Questions Outlines, interrogatories, demands, other legal forms, to organize you, and speed your discovery with efficiency. Guaranteed! Checklists – You will be so prepared for your deposition questions, you can focus on the other aspects in developing the case. Other legal forms for discovery, requests and interrogatories – a lawyer mentor in a box, coaching you on the points you should consider in the premises liability case, during your examination of the adverse party, or of a witness, and in all phases of discovery. Our form checklists PREM003 and PREM006 are for different parties. (investigation) preparation for investigation of the premises and of the other side’s possible information. (trial) preparation of trial questions. You have nothing to lose. Everything’s guaranteed. No questions – 100% money back if you think a form is not worth every penny. No red tape. Just ask. The deposition question outline forms and other litigation forms in this section of our product catalog focus on premises cases, whether it is a retail store customer fall down, a property loss or personal injury from fire or explosion, a product failure on premises, the bodily injury of a construction worker, the collapse of a building, or any other personal injury or property damages arising on premises of the defendant. The unifying features of all these cases, that brings them under the umbrella of premise liability law, is the design, construction, maintenance, and operation of the real estate premises, including protection of the occupants during operations on the premises.